The best stereo speakers of the 21st century | What Hi-Fi? Since the What Hi-Fi? Awards started back in December 1983, we've seen some fine examples of speaker craftsmanship. Each year we've selected our favourite pairs of stereo speakers across a wide spectrum of prices, and each year one outstanding pair was given the Product of the Year badge - the best of the best. The winners we've selected here aren't just the best-value speakers in their respective price category, but they also exemplify our performance-per-pound ethos. Either way, it's a look back down memory lane at some of the best speakers we've heard this century - and it's a fairly formidable shopping list should you be in the market for a second-hand pair of speakers. The first stereo speaker Product of the Year of the new millennium was the Mission 780, the smallest of the 78 series. Not only were the 780s a stellar example of craftsmanship, we were also impressed by how big these Mission speakers sounded. Equally as capable with rock tracks as with more subtle songs, they got the 21st century off to a fine start, winning two years in a row. The Mission 780s were unable to make it a 21st century hat-trick after being displaced in 2002 by the 11Ls, which saw an audio manufacturer with a fine high-end pedigree go after the mainstream market. The results were quite stunning, with features that would ordinarily belong at the premium end of the spectrum being brought fully into reach for those on a more modest budget. "Luscious looks combined with brilliant sonic performance mean the awesome-value Quad 11Ls hang on to the top Award" - with that verdict, you can understand why these speakers won again in 2003. No doubt a familiar name to many an audio connoisseur, Wharfedale's Diamond range of budget speakers has played a formidable part in the history of our Awards. Ever since the series first made its debut back in 1983 (like our Awards), we've been rather taken with them. The 9.1s took the performance of sub-£200 speakers to a whole new level. Unlike many of their contemporaries, the sub-£500 iQ5 floorstanders retained that element of bass control and mid-range realism that could often be sacrificed in favour of deeper bass reach and greater scale. 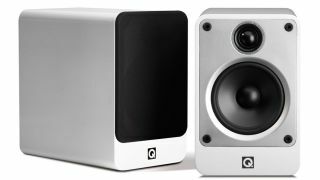 With a big, confident and poised sound that belied their modest dimensions, the iQ5s proved themselves to be peerless when it came to picking the best stereo speakers in 2005 and 2006. While it wasn't quite in the speaker wilderness, a good few years had passed without B&W having a strong contender at this price. Then in 2007, the 685s came along. It was quite some return, as these standmounters put in a performance more than capable of worrying all but the very best below £1000. We probably listened to the 685s more than any other product in 2008, aside from our reference systems. With brilliant composure among the many positives, they were fantastic value for money and deservedly retained their Award in 2008. "A stunning achievement for the cash". The 10th-generation of Wharfedale's Diamond range picked up where its predecessor (the 9.1) left off in 2004. Not only could these standmounters outperform just about any price-comparable speaker, but plenty from the price-class above, too. The 2010 Product of the Year deservedly went to Monitor Audio's Bronze BX2s. Incredible value for money and with so much going for them in terms of performance, they were still winning Best Buy Awards two years later at their price point. Throughout 2011, these KEF standmounters sat at the top of the pile, seeing off challenges from many worthy competitors. In the end, the Q300s were crowned Product of the Year for their all-round prowess. Looking back since the turn of the millennium, KEF has shown some serious aptitude in the stereo speaker stakes. After the iQ5s and the Q300s came the more upmarket and impressive LS50s, which duly won the Product of the Year in 2012. And judging by their Readers' Award successes in 2013 and 2014, you were every bit as taken with them as we were. It has been a remarkable journey for Q Acoustics. The company was only founded in 2006, yet its stereo speakers have bagged at least one Best Buys Award in each subsequent year. The Concept 20s are arguably the company's crowning glory: named our Product of the Year 2013, it was one of the simplest decisions we've had to make in this category. B&W made a major comeback with the redesigned 685 S2, nabbing two successive Product of the Year Awards for their mid-priced marvel. They're superb speakers, with their huge sense of scale and excellent dynamics setting them apart from the competition. Dynaudio took to the 2016 podium, winning an Award for the £600 M20s, knocking the formidable B&W 685 S2s down to four stars in the process. The Emit M20s took the Product of the Year title, thanks to their big, exciting sound, and excellent dynamics. Back on the throne five years after its still-tremendous LS50s took a Product of the Year Award, KEF delivered one of 2017's best pound-for-pound hi-fi products of any type in the Q350 standmounters. Subtle and muscular, open and detailed, plus handsomely imposing when on some suitable stands, the KEFs laid all before them. KEF held on to its Product of the Year title, but in 2018 it was for a completely new product. The new R3 speakers are simply exceptional. They offer subtle dynamics and insight far beyond its rivals can, sound balanced, big and punchy, and are just utterly natural musical performers. They're so good they even knocked the superb ATC SCM 11s off its decade-long winning streak to become our favourite speakers in this price range. The KEF R3s may be the priciest speaker we've given this coveted title to, but it's entirely deserving of the attention.